Captain Grimm is a dedicated airship captain who has fallen into disrepute. Instead of in its military, he serves Spire Aurora by catching pirate ships on his free ship named Predator. However, when Aurora is attacked by a neighboring spire, he must take on a more dangerous mission looking for the enemy who may be lurking within Spire Aurora’s ranks. Besides the grim captain, the mission includes two feisty young women, a loyal (but disdainful) cat, and a young warrior of the guard. This is a fantastic addition to Butcher’s repertoire. Of his books, I’ve only read the Dresden ones, and then only a few, but I’ve loved every book by Butcher that I’ve ever read. This is no exception. It has adventure, fantasy, steampunk, science fiction and cats. How can that ever be a bad combination? I look forward to the next book in this series, and am now sorely tempted to pick up another Butcher book very, very soon. Looks interesting. One of these days I should try steampunk! I have not read any steampunk but I think that I would like it. I have a fascination with airships both real and fictional so that aspect is interesting to me. This sounds like such a fun book to listen to! 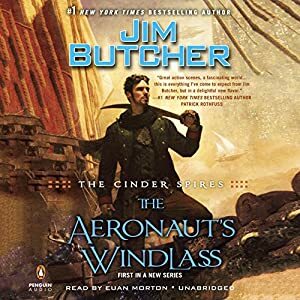 I've read only Butcher's Dresden series and the first book in his Codex Alera series, but I'd also like to read more. Steampunk is pretty interesting. I haven't read much of it myself, but I've enjoyed what I have read. If you have a fascination for airships steampunk is the perfect genre for you – at least when you want to read something a little lighter. This book is a great place to start. It's really good. Yeah, Butcher is fantastic, isn't he? I need to read more of his work. I still haven't read the Harry Dresden series. Jim Butcher looks like a writer whose books I'd love, but I don't know why I never pick them.